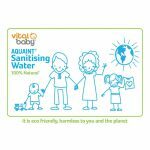 The Vital Baby brand continues to rejuvenate its range of feeding products with technology, consumer feedback and marketing experts to ensure that its brand continues to grow within the industry. The Summer of 2019 will see an almost new range launched with additional SKUs and production functionality that retailers will be able to access from Baby Brands Direct at wholesale trade price. This Spring Vital Baby continues to support the independent trade with an additional 10% off trade price on its current lines at BabyBrandsDirect. Top lines for retailers to stock include the unbelievable suction bowl – the simple easy to attach bowl in 4 quick steps that firmly secures the bowl whilst being easy for adults to unlock. The other hero product to consider is the Vital Baby BabyFood Pro that caters for baby’s nutrition at each stage of development. 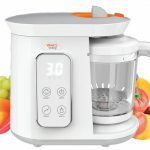 It can be used to warm bottle feeds, and has steam and blend functionality to create first purees through to chunkier foods. Its designed to ensure that nutrients and flavour are preserved and bottles and food jars warmed evenly. Its already achieved, in its first year of launch the Silver for Best in food preparation for weaning by Baby and Toddler Gear 2018. Other favourites from the brand under licence include the Aquaint Sanitising Water in 50ml and 500ml as well as Ella’s Kitchen twin pack weaning spoon tips. The former is a must have item for all specialist baby retailers as it’s a multipurpose 100% natural antibacterial sanitising water that kills 99.9% of bacteria in seconds. The latter item benefits from the dual branding of Ella, who is well known for baby’s food and therefore a trusted brand for the purpose of feeding baby in conjunction with baby food pouches. There are lots of Vital Baby products available for supply to independent baby, nursery and pharmacy retailers at trade price from multi award winning wholesaler Baby Brands Direct. Log in now for the extra discount – trade offer ends 24th Feb.